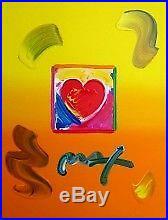 Stunning Heart, Mixed Media (Acrylic & Lithograph), Peter Max - SIGNED with COA. HIGHEST EXCELLENT QUALITY ORIGINAL FINE ART LITHOGRAPH. HAND SIGNED BY ARTIST PETER MAX! PETER MAX RARE FABULOUS BEAUTIFUL PETER MAX. This is your opportunity to own a fabulous original. Original Acrylic & Lithograph on Arches paper, 2010. Paper Size: 11 x 8.5. Signed in acrylic by the artist. Excellent Condition; never framed or matted. This is one of Peter Maxs most dazzling and beautiful works! Great amazing harmonies of color, space and composition make it an absolute winner and one of his most exciting collectible works! Features gorgeous exciting color tones in deep rich hues on this print, excellent! These elegant striking pieces would make a splendid impression and fantastic statement anywhere. Features incomparable colorations and beautiful lines on these prints. This piece is stunning in person, photo does not do it justice. Made of the very Finest Archival Museum quality paper. This is an outstanding piece in excellent condition that has never been framed, this rare artwork is highly desirable for art collectors! ARTIST PETER MAX (Born: 1937). German born American artist, Peter Max is best known for his fantastically colorful images and exciting exuberant style. Pop artist Max, like his contemporary Andy Warhol, had created his own artistic force with iconic figures and has captured the faces of the Statue of Liberty, the Mona Lisa, Mick Jagger and George Washington in his one of a king Technicolor style. This acclaimed artistÂs work is also held in prestigious museum collections around the world. Born in Berlin, Peter lived in China, as a child and traveled to India, Africa, and Israel and Paris, until his family moved to the U. Trained at the Art Students League, Pratt Institute, and the School of Visual Arts in New York. When he left art school in the 1960s he began producing, cosmic imageryÂ that catapulted him to prominence and garnered him the cover story in Life magazine. Max is noted for his surging graphic designs in bright, vibrating colors while incorporating psychedelic and celestial motifs. Max is a creative and prolific artist who has worked with acrylics, oils, water colors, pastels, charcoal, etchings, engravings, lithographs, serigraphs, silk screens, sculpture and graphics. Max's Cosmic'60s art Pop imagery captured the imagination of an entire generation and catapulted the young artist to fame and fortune. Max is a painter for four former U. Presidents Carter, Ford, Bush and Reagan and created posters for Bill Clinton's inauguration. Max has had numerous International museum shows, and gallery shows worldwide. His works appear in the prominent collections of many major museums. The item "Stunning Heart, Mixed Media (Acrylic & Lithograph), Peter Max SIGNED with COA" is in sale since Sunday, August 12, 2012. This item is in the category "Art\Art Prints". The seller is "eselleronline" and is located in Beverly Hills, California. This item can be shipped worldwide.